Salt Lake City, UT - Reliance Metalcenter has completed a major upgrade of its 50,000# x 72" x 5/16" Cut-to-Length Line in Salt Lake City. The objective for the extensive equipment upgrade was to improve productivity and performance, and improve Reliance Metalcenter's ability to satisfy its customer's requirements for panel-flat laser quality high-strength sheets in gauges from .028" through 5/16". The line upgrade included a new computer controlled 300 HP "plunge" type Hydraulic Cassette Leveler, a 75 HP Servo Roll Feed, a Hi-Performance Hydraulic Cut-Off Shear, and new state-of-the-art electronic controls. 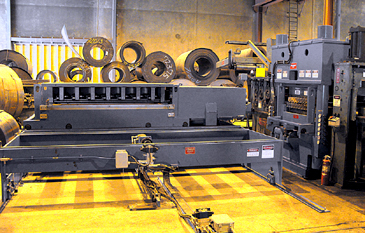 Reliance Metalcenter's 72" x 5/16" CTL was originally equipped with a 3.500" x 17-roll x 5-adjustable flight x 200 HP "mechanical" Leveler, a 60 HP Servo Roll Feed, and a mechanical Shear. The mechanical Leveler was replaced with a 300 HP x 7-adjustable flight Hydraulic Cassette Leveler with two (2) quick-change Cassettes, the Roll Feed was upgraded to a 75 HP Servo Roll Feed; and the mechanical Shear was replaced in favor of a Hi-Performance Hydraulic Shear. 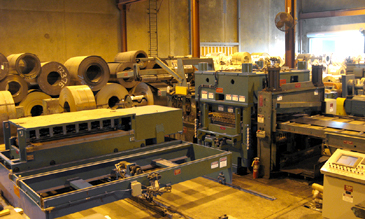 The remaining original line components including a 50 HP Entry Coil Straightener and 30' Air Float Sheet Stacker were re-employed in the upgraded CTL. A new 300 HP Two Cassette Hydraulic "plunge" Leveler replaced the original fixed roll mechanical Leveler. Exchangeable Leveler Cassettes are stored on a power Injector Cart that can accomplish a Cassette exchange in 2-minutes. This photo shows the 1.750" x 5-Hi Cassette staged on the Cassette Injector Cart, while the 3.500" x 4-Hi Cassette is leveling coils. The 7-flight Cassettes are self-contained with all work rolls, intermediate rolls, back-up flights, and universal drive shafts installed within the Cassette frame. The top half of the Cassette can be quickly lifted off the bottom half to expose all the work rolls and related parts for cleaning and other periodic maintenance. The ability to easily work on all the working parts exposed and outside of the Leveler frame makes preventative maintenance easier, quicker, and more likely to happen regularly. Just as important, the Cassette Leveler allows perdiodic maintenance to be accomplished while the other Cassette is running. No production time is lost to roll cleaning and maintenance. New Hydraulic "Plunge" Leveler: Reliance Metalcenter greatly enhanced its ability to produce panel-flat laser quality, high-strength stheets throughout a wide gauge range with the installation of a Hydraulic "plunge" Leveler equipped with two (2) quick-change Cassettes. 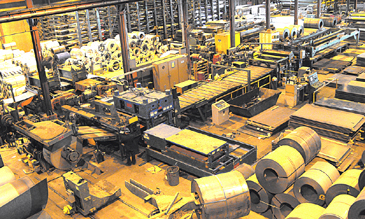 Based upon coil gauge and mechanical properties, Reliance Metalcenter is able to employ either a 3.500" x 4-Hi or a 1.750" x 5-Hi Leveler Cassette to produce flat, flat sheets for its customers. The new Cassette Leveler employs 14-independently controlled hydraulic cylinders rather than gearmotors and sliding wedges to position the work rolls for straightening and shape correction. The 14-cylinders, each fitted with a computer controlled linear voltage transducer, provide precise position accuracy required for quality shape correction. The cylinders are capable of generating an enormous work roll plunge force, which allows Reliance Metalcenter to achieve laser flat high-strength sheet quality. A massive 4-post Cassette Leveler frame, engineered for stability and rigidity while plunge leveling, contains the Cassette when running. Computer Leveler Controls: Reliance Metalcenter's new Cassette Leveler employs a computer to minimize leveling "black art" and to generate consistent results when run by several machine operators. Automatic Leveler set-up is achieved by entering gauge, yield strength, and strip condition . . . edge wave-center buckle data. Computer override controls allow the operator to make adjustmetnts while running. The computer program stores specific Leveler set-ups for future order number recall, a time and scrap saving feature particularly when leveling partial coils or when breaking into a production run for a quick delivery order.